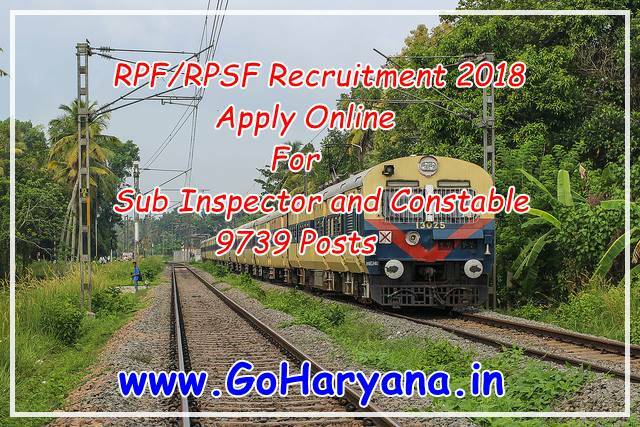 RPF/RPSF Recruitment 2018 - Railway Protection Force/Railway Protection Special Force has released the recruitment notification for the post of Constable and Sub-Inspector(SI) vacancies. For Constable(Executive) - SSLC/Matric from a recognized Board. For Sub Inspector(Executive) - Graduation from a recognized University. Age Relaxation: Age relaxation is admissible as per rule. Selection Process: Candidates will be selected on the basis of CBT(Computer Based Test), PET(Physical Efficiency Test) and PMT(Physical Measurement Test). Application Fee: The Application fees is to be paid online through digitally i.e. Debit Card/Credit Card/ Net-Banking or offline through SBI Bank Challan/Post Office Challan. How To Apply: Interested & Eligible Candidates can apply online through official website of Indian Railway from 01-06-2018 by 10:00 AM to 30-06-2018 by 11:59 pm. Railway Protection Force is going to disclose RPF SI Admit Card 2018 shortly. Eligible candidates can utilise the direct link attached here at the bottom of the page to get RPF Sub Inspector Call Letter. Furthermore, you can also reach up to the RPF Official Website i.e. indianrailways.gov.in for complete details. In fact, you can get a clear cut idea about RPF Sub Inspector Selection Process, Exam Pattern by referring the entire article. In addition, you can also gain knowledge on RPF SI Hall Ticket Release Date, Sub Inspector Exam Date 2018. Scroll down the page to know more about Railway Protection Force Admit Card 2018.